How do you get your own television garden show started? Buy a camera, go to Baja California, shoot some video, learn how to edit it, then hope someone might be interested in watching it. That’s what I did, and it worked! I never did completely finish editing my video, but hope to someday. Shooting the video is the fun and easy part, but I discovered that good editing takes TONS of time- especially when you don’t know what you're doing. 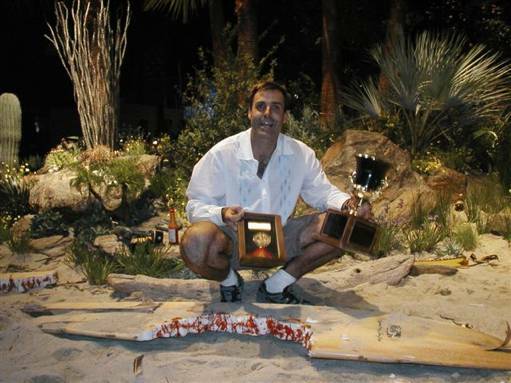 My video was called “Livin Cheap in Baja” and it was all about the process of creating a major exhibit garden at the San Francisco Flower and Garden Show. The exhibit was the beach camp of a fictional character named “Joe” who was a Vietnam draft dodger who loaded his VW van, and defected to the sunny shores of Baja California never to return to the States. His van eventually broke down and this is where he made his home. I even created a poster for it that we also made into limited edition tee shirts. If you like it they’re only $20 including postage. My super cool poster with native Baja Washingtonia palms and flowering agaves. 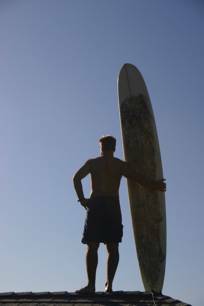 Yours truly on my roof with my board to create the image. It looks warm, but it was actually an early January morning sunrise with frost- BRRRRRR! It stars myself and Sarah Hayward and we include a colorful inspiration trip through Baja California, the construction of our exhibit including time lapse of our garden and the entire show room floor, interviews from show goers, and even a how to demonstration of an arts and crafts project creating a realistic bloody shark bite through a surfboard which was one of our garden ornaments. Notice the red hot sauce! Needless to say, the whole process was a lot of fun. Here are some more beautiful and fun photos from our experience. See, there really was a shark! 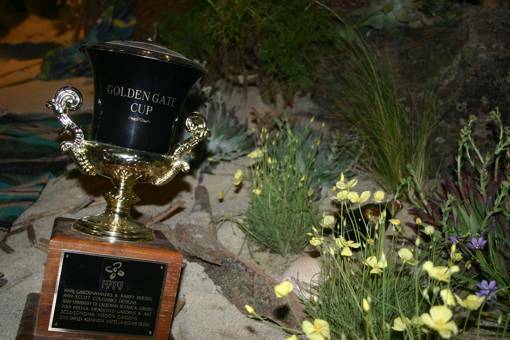 The best of show “Golden Gate Cup” washed up with the previous night’s high tide along with other debris. Gary in Heaven. 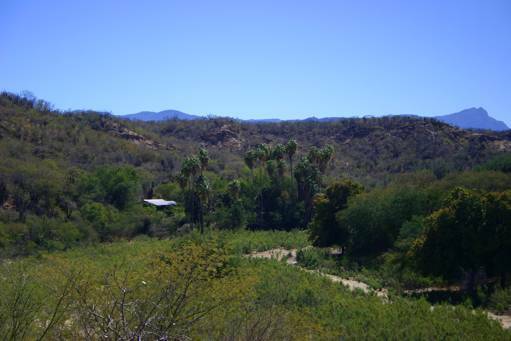 A mid elevation Brahea brandeegei palm oasis and boulder wash in the desolate Sierra de la Laguna Mountains of Southern Baja. 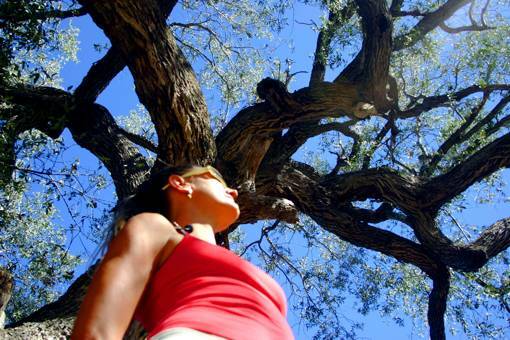 Sarah strikes an interesting pose under a desert oak. 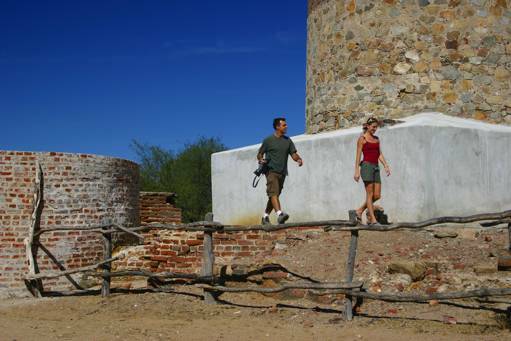 Sarah and Gary exploring the abandoned ruins and giant smoke stack of the El Triunfo Silver Smelter dating from 1862. 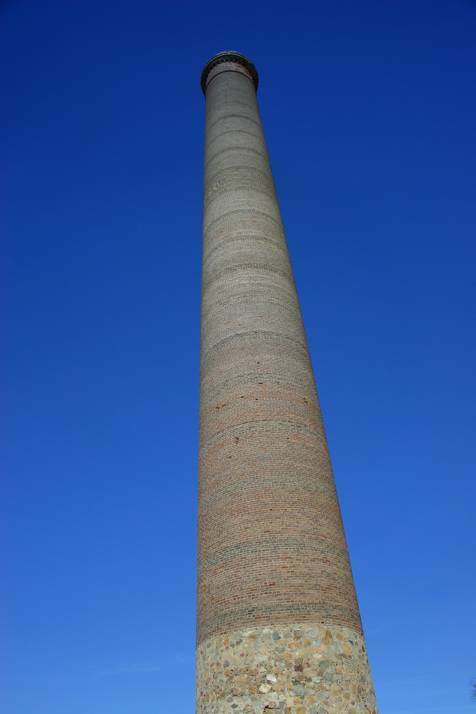 Giant stone and brick masonry smelter smoke stack in El Triunfo under the big blue Baja sky. I guess size must matter after all! 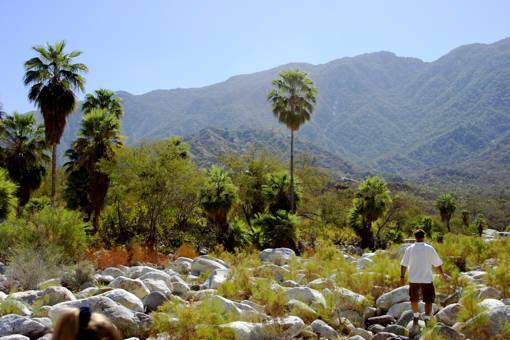 The real deal: a small, isolated homestead amidst a grove of Washingtonia robusta palms. Is this where Joe lives I wonder? 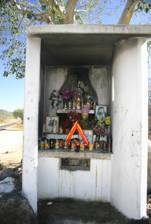 A sobering roadside memorial built directly into the charred side of a towering Baja Rock Fig (Ficus palmeri) presumably at the point of impact for the family that died there. 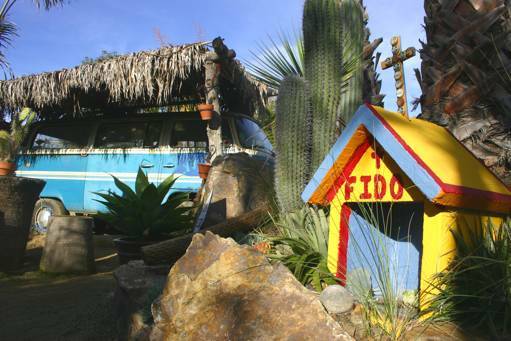 These sadly abundant memorials are morbidly beautiful in there own way and we decided to create a fictional memorial for Joe’s fictional dog “Fido” who fictionally was run over by a fictional semi truck on the “Curva Peligrosa” on the highway adjacent to Joe’s fictional camp. Don’t worry, no animals were harmed during our production. 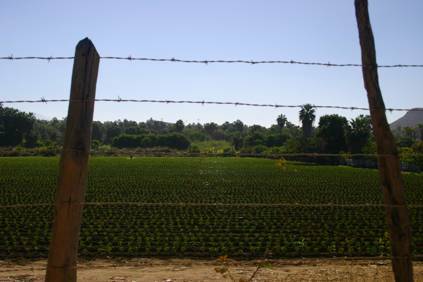 The lush agrarian valley of Todos Santos. 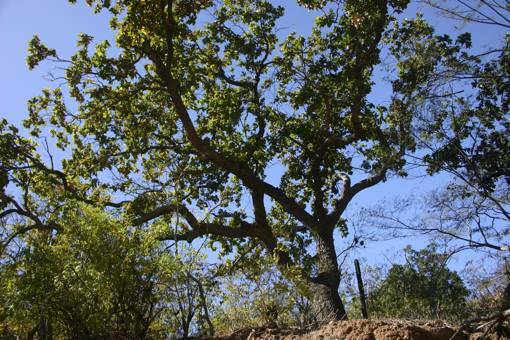 Surprisingly, three different oaks inhabit Southern Baja, this one is Quercus peninsularis and looks remarkably similar to our native Valley Oak, Quercus lobata. 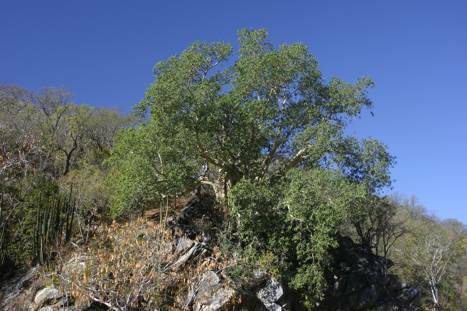 An interesting Baja endemic “Elephant Tree” (Pachycormus discolor) so called for its bark and thick trunk shape. Elephant tree’s thick trunks store water and conduct photosynthesis allowing the tree to live without leaves for very long periods of time. When the rains do finally come, it dramatically bursts into leaf. Really big Rock fig finding a happy home on a really big rock. 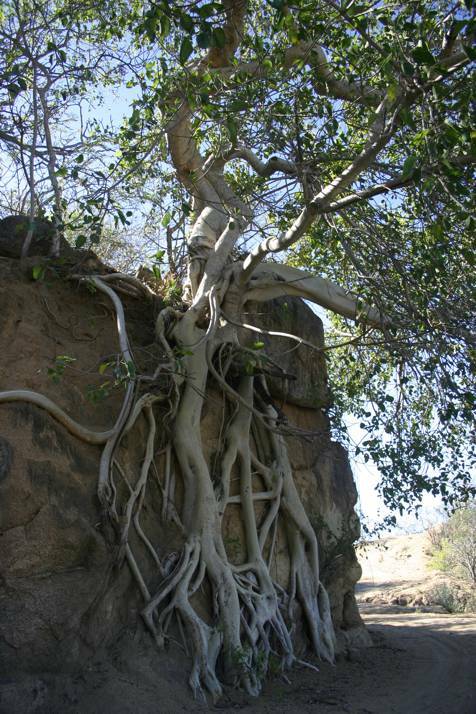 My favorite plant of all we found growing in the Cape region was the Rock Fig, (Ficus palmeri). It's remarkable that this lush, broad leafed dark green evergreen tropical tree would be growing in such a dry condition amongst massive boulders that retain no moisture at all. It obviously is an adapting evolutionary holdout from a lusher, more tropical era, much like our locally native Madrone, Arbutus menziesii. Lush green foliage of the Rock Fig. The leaves seem to curl to deflect the harsh, drying rays of the sun. 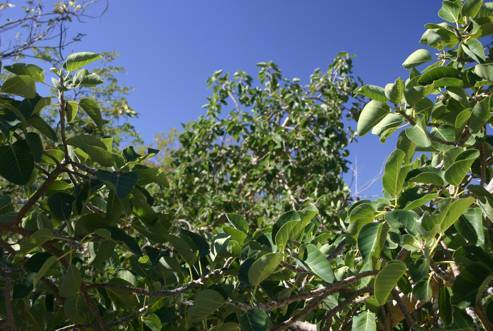 The leaves are also thicker than you would expect, another adaptation to help the tree retain and conserve moisture to allow it to grow in the desert. There’s more than one way to hold the side of a wall up! I should have taken photos, but I got our car sideways off a bit of a cliff on this very same road and had to tie ropes to adjacently opposite Rock Fig roots like the ones shown above to help pull the car back onto the road. Lesson learned? If you are going to veer off of a steep Baja mountain road, make sure you do it where there is a big Rock Fig on the adjacent roadside to pull yourself out. The root system of this tree gives us another vital key in solving the mystery of how such a lush looking tree survives in the dry desert. It’s massive and pervasive- if there is any water nearby, these roots will find it. 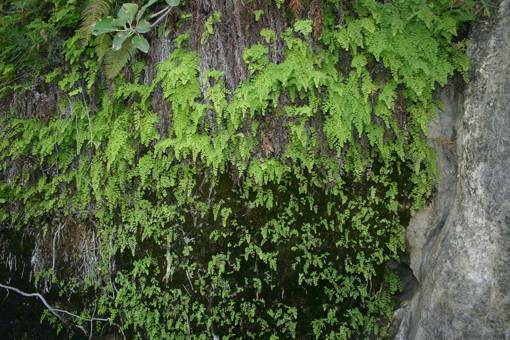 Also, the sheer biomass of this extensive root system acts as a vital reservoir for water storage. 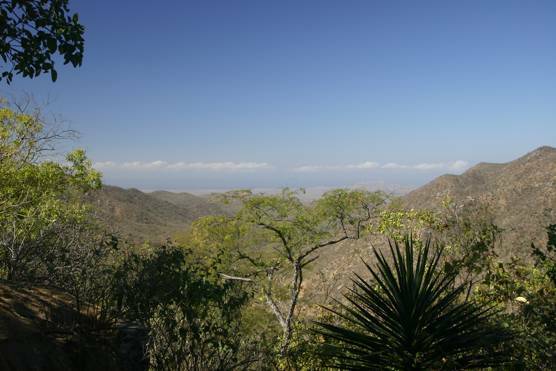 And alas, a scenic view of the Pacific Ocean from the Sierra de la Laguna Mountains. 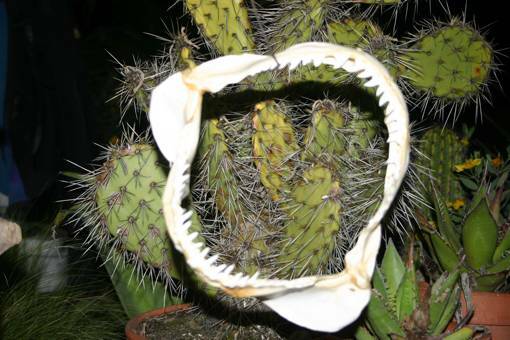 Baja is a fantastic place with many surprises and an interesting history. So get off of your computer, and go check it out! 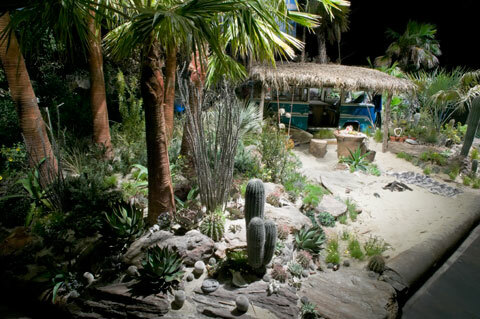 And what about our Baja exhibit at the SF show? Well the sad thing about the show is that the gardens created only live for 5 glory filled days, then are torn down never to be seen again. We couldn’t let this happen to Joe’s beach camp, so we resurrected it, shark eaten surfboard and all, at the entrance to our Richmond Nursery. Come check it out and sit where Joe sat and feel the life he led. Sometimes, late in the afternoon, when the sun is sinking and the light is changing, and only on warm days, Joe’s ghost can be seen around the camp. Joe’s story begins in 1972, at the height of the Vietnam War. Fresh out of college, many of Joe’s friends are being sent off to Southeast Asia and returning home in flag-draped body bags. Joe makes a pivotal decision to not support the war and preserve his own existence. 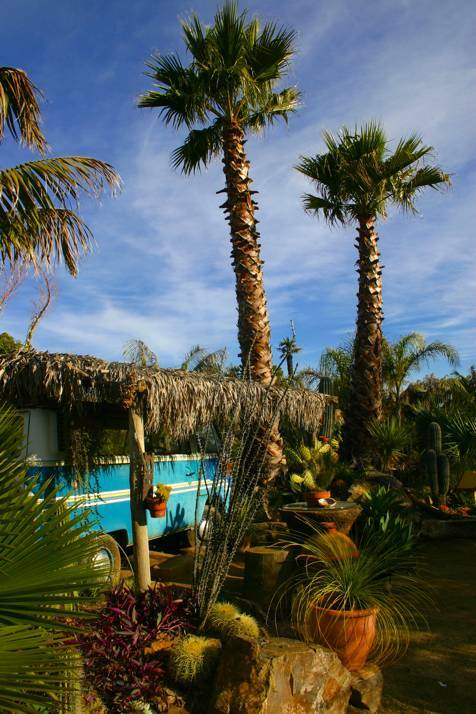 He loads his personal belongings into his Volkswagon van and heads south to the Baja Peninsula. Not sure what to expect, he seeks a simple, cheap, peaceful life and to avoid the growing chaos swallowing the “developed” world to the north. 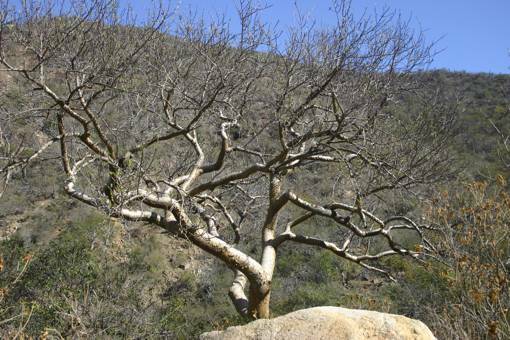 Joe travels from place to place throughout Baja compelled by the vernacular: a diverse terrain punctuated with both familiar and exotic flora. Money is always a problem for Joe, and eventually his transportation gives out for good. But fortunately, it’s in his favorite place of all; a small protected cove where land intersects sea. 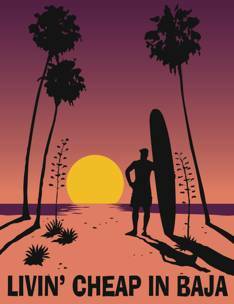 There’s abundant sea life, a shady palm grove, and most importantly, a perfect left hand surf break. His decision is final. Joe shall live out the rest of his days here. Who needs money when you live in paradise?